The FOG Ordinance sets forth requirements for food service establishments to aid in the prevention of sanitary sewer blockages, obstructions, and overflows due to the contribution and accumulation of fats, oils, and grease (FOG) into the City sewer system. FOG requirements for FSEs include the proper grease control equipment (GCE) design, sizing, installation, maintenance cleaning frequency, minimum of annual inspection and certification of all GCE by a City certified grease waste hauler (GWH) or plumber, implementing best management practices (BMPs), and associated record keeping. Any change of ownership of existing FSE or FSE applying for a new business license shall have grease control equipment (GCE) as approved by the City’s FOG Program prior to obtaining the FOG Program Coordinator’s signature on a business license compliance form. Owners of commercial property will be held responsible for installation of City approved GCE. All FSEs fall under a “General Fats, Oils, and Grease (FOG) Permit” for authorization to discharge commercial wastewater from FSE food preparation and kitchen service areas to the City’s sanitary sewer collection system. To view or download a copy of the “General FOG Permit” click here. All new FSEs shall complete a “FSE FOG Inquiry Form” which shall be the application for a “General FOG Permit”. To view or download a copy of the FSE FOG Inquiry Form click here. All FSEs are required to implement BMPs and to display “BMP” and “No Grease” posters in the kitchen area. Posters may be obtained from the FOG Program. FSEs shall keep records on all grease control equipment (gravity grease interceptor and/or hydro-mechanical grease interceptor) maintenance, cleaning, and repairs on site for a minimum of 3 years. The records must be made readily available for inspection by the City’s FOG Program. Grease traps (hydro-mechanical grease interceptor or HGI) shall be completely cleaned of fats, oils, and grease and food solids at a minimum of every thirty (30) days. If the FOG and food solids content of the grease trap are greater than 25%, the grease trap must be cleaned as frequently as needed to prevent 25% of capacity being occupied with FOG and food solids. 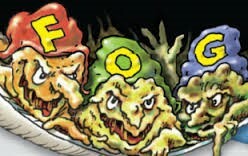 A written record (Food Service Establishment Grease Trap Self-Monitoring Checklist Form F) of grease trap cleaning and maintenance shall be maintained onsite at the FSE and provided to the City upon request. To view or download Food Service Establishment Grease Trap Self-Monitoring Checklist (Form F) click here. All GGIs shall be cleaned at a minimum of every 90 days or when they reach 25% capacity on the interceptor’s inlet side. This is referred to as the “25% rule”. Click here to view or download guidance on the “25% rule”. FSEs having a gravity grease interceptor (GGI) are required to maintain a Gravity Grease Interceptor Inspection Self-Monitoring Checklist (Form G) to ensure compliance with the “25% rule”. Compliance with the 25% rule will require mandatory staffing measurements of the GGI. To view or download Gravity Grease Interceptor Inspection Self-Monitoring Checklist (Form G) click here. 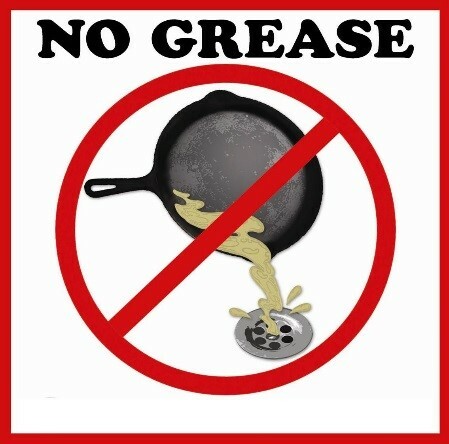 The FSE shall only use a City of Dothan approved certified grease waste hauler company to clean/pump a gravity grease interceptor (large tank usually in the ground outside that receives the kitchen wastewater and retains the FOG and food solids). Click here to view or download a current list of the City approved certified grease waste hauler companies. This requirement is effective July 1, 2016. The FOG Program surcharge fees shall increase by 2.85 percent starting October 1 of the year following approval of this FOG Ordinance and then increase by 2.85 percent each October 1 thereafter, or as modified based on CPI, whichever is greater. The current monthly FOG Program surcharge fees are available for review at the Planning and Development office.